Coffee is a global beverage: it is grown commercially on four continents, and consumed enthusiastically in all seven. There is even an Italian espresso machine on the International Space Station. Coffee’s journey has taken it from the forests of Ethiopia to the fincas of Latin America, from Ottoman coffee houses to ‘Third Wave’ cafés, and from the simple coffee pot to the capsule machine. 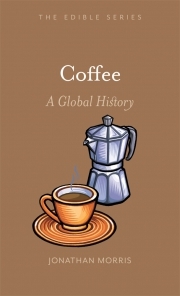 In Coffee: A Global History, Jonathan Morris explains how the world acquired a taste for coffee, yet why coffee tastes so different throughout the world. Morris discusses who drank coffee, as well as why and where, how it was prepared and what it tasted like. He identifies the regions and ways in which coffee was grown, who worked the farms and who owned them, and how the beans were processed, traded and transported. He also analyses the businesses behind coffee – the brokers, roasters and machine manufacturers – and dissects the geopolitics linking producers to consumers. Written in an engaging style and featuring wonderful recipes, stories and facts, this book will fascinate foodies, food historians and the many people who regard the humble coffee bean as a staple of modern life. Jonathan Morris is Research Professor at the University of Hertfordshire. He is a historian of consumption and consumer societies, co-editor of Coffee: The Comprehensive Guide to the Bean, the Beverage and the Industry (2013), and a judge for the Speciality Coffee Association’s Best Product in Show awards.